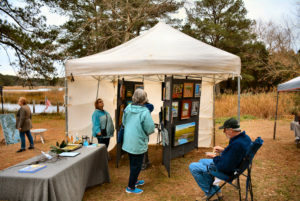 From Cape Charles to Onancock, 43 talented Eastern Shore Virginia artists and artisans threw open their studio doors, welcoming the world to enter and discover the unique items on offer during the 16th Annual Artisan Holiday Tour this past Friday and Saturday. It may have been cloudy and then rainy outside but inside the many stops on the 14 studio plus Chatham Vineyard self-driving Tour, it was cozy, friendly and warm. Unfortunately, because of a late start we didn’t make it to every location….. but there’s always next year ! 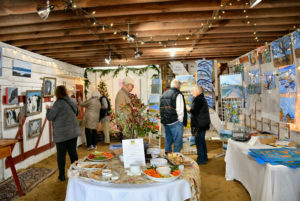 We kicked off at the Milby Barn Studio at Chatham Flower Farm located in Painter where we were greeted by Kate Meyer, likely humorously known as the Painter of Painter. ( Also the hostess of the recent and hugely successful Farm-to-Table dinner which we unfortunately missed.) 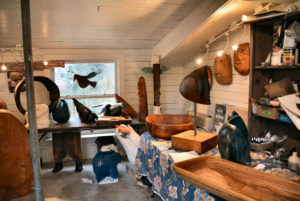 From there forward to Maurice Spector’s studio featuring unique wood and stone sculptures. 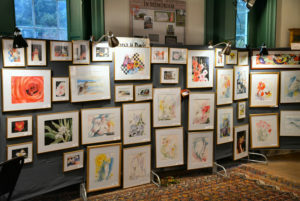 Mo hosted 4 other artists at his waterfront home including David Crane, Miriam Riggs, Marty Burgess and Guy Shover. Oysters were on the grill, smoke drifting, aromas tempting, totally relaxing. Onward to By The Bay Alpaca Farm, one of my perennial favorites. 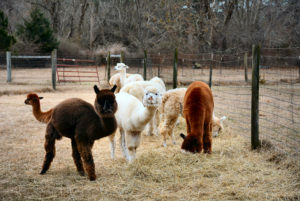 Their alpacas are so cute- – when you pet them they are delightfully warm and luxuriously soft and silky ! Definitely the place to stock up on alpaca sox, perfect stocking stuffers for anyone on your List who fights cold feet all winter ! 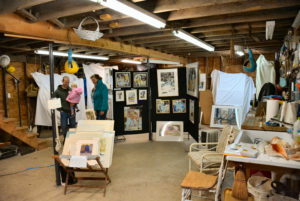 From there we were off to the tiny town of Harborton where Windhorse Barn and Studio overlooks Pungoteague Creek. 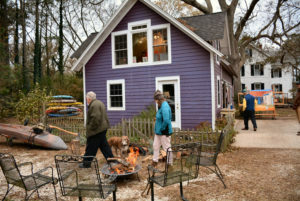 Painted a whimsical shade of fuchsia , the Barn hosted multiple artists and offered a blazing fire pit surrounded by plenty of chairs to enjoy it. After a lunch break at Janet’s Cafe in Onancock, (home to one of the best roast beef sandwiches on the entire Shore), we stopped in at Danny Doughty’s studio. ( Danny and his work were honored earlier this year at the University of Virginia’s Batten School of Leadership and Pubic Policy. ). 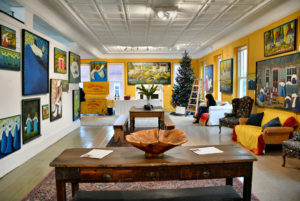 Located above the Red Queen Gallery, Danny’s was not on the official Tour but we are huge fans of his work and wanted to see what new pieces were hanging on the walls of his large and light-filled gallery. Plus he always has a spectacularly decorated Christmas tree ! 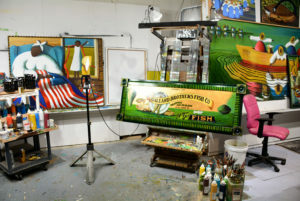 Well, this year the tree was “Under Construction” but Danny’s fabulous new art work definitely did not disappoint, including a large Ballard Fish company commissioned painting on which he is currently putting the finishing touches. Just a few blocks over, the Vesna Zedovic studio. 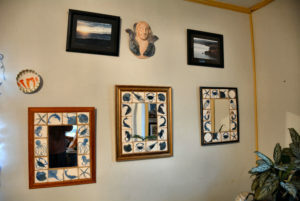 Vesna’s mirrors, framed with a surround of hand-cast pottery tiles of sea creatures or butterflies or flowers are really amazing. 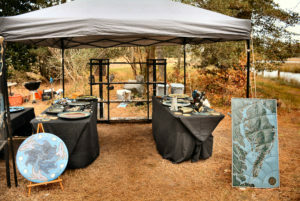 We’re lucky to have a small collection of beautiful her red clay tiles stretching back many years to when we first saw her pottery at the former Old Thyme Garden and Gifts in Weirwood. Vesna is still going strong nearly 30 years later although working primarily in white clay now. 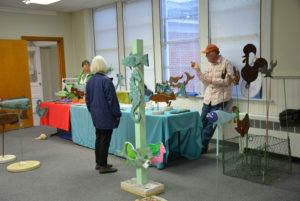 By then the rain was really doing its thing but nobody seemed deterred as we rolled up to the Ker Place Museum where Gertraud Fendler’s sea glass jewelry, David Farlow decoys and Diana Davis watercolors were being shown as part of the Tour. 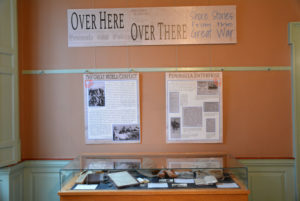 In addition, the Museum itself had a featured exhibit of Shore WW I memorabilia, pretty interesting. 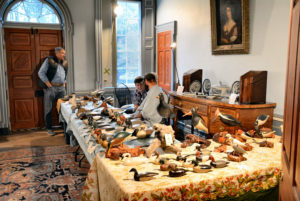 And then to our last stop of the day, the historic Onancock School with its numerous exhibitors. We took a moment to watch carver Brad Bradach work on one of his miniature decoys before slipping over to see what Bobby Bridges, Billy Crocket, Elizabeth Hunt and Laura McGowan were showing. 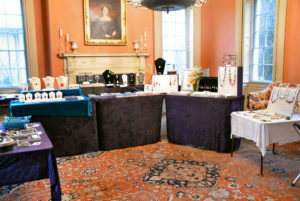 Everybody had beautiful things on offer, unique, one-of-a-kind art, perfect for a distinctive holiday gift for a Special Someone or possibly, dare we say it….. a holiday gift for oneself ! And then, all over, time to go home after a long but delightful day ! But definitely ready to do it all again next Thanksgiving !